Gangliosides: distribution in brain and nervous tissues indicates important roles with cell external ligands and membrane components. - Advanced ImmunoChemical Inc.Advanced ImmunoChemical Inc.
Home » Assay Notes » Gangliosides: distribution in brain and nervous tissues indicates important roles with cell external ligands and membrane components. Gangliosides are a large group of sialylated glycosphingolipids that are widely expressed in mammalian tissues and are particularly abundant in brain and nervous tissues. The differential distribution of gangliosides in various tissues is a strong indication they play important roles in specific functions in different tissues. Gangliosides as a full product line are now available at Advanced ImmunoChemical. Click here for Ganglioside AssayNotes and product information. 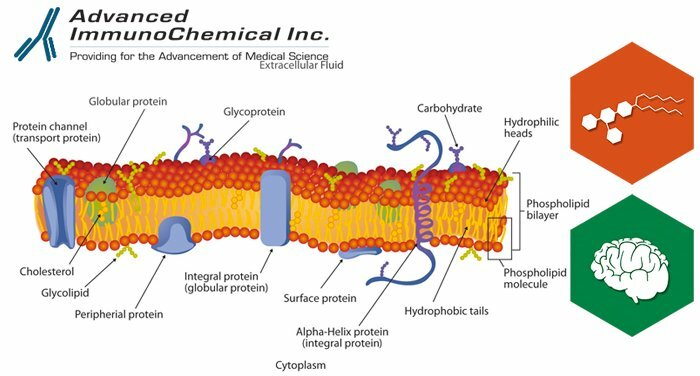 Glycosphingolipids (neutral glycosphingolipids and gangliosides) are formed biosynthetically within the Golgi apparatus. Gangliosides are involved in a number of interaction processes with cell external ligands and cell membrane components. Gangliosides seem to be involved in cell-to-cell interaction and regulation of cell signaling. They can be receptors of proteins, viruses and bacteria (GM1 is a receptor of Cholera toxin). Gangliosides also play a role in the cell proliferation. The differentiated cells in human melanoma express GD3 and other b series gangliosides such as GQ1b, whereas GM3 can be involved in the differentiation of some lymphocytic cells. See our AssayNotes and references below for more characterization and discussion. Kolter T., Proia RL., Sandhoff K., Combinatorial Ganglioside Biosynthesis. J Biol Chem. 2002 Jul 19;277(29):25859-62. Jeyakumar M., Butters TD., Dwek RA., Platt FM., Glycosphingolipid lysosomal storage diseases: therapy and pathogenesis. Neuropathol Appl Neurobiol. 2002 Oct;28(5):343-57.